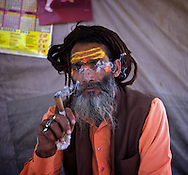 The Maha Kumbh Mela is the largest religious gathering on earth, it' a mass Hindu pilgrimage of faith in which Hindus gather in the world's largest religious gathering and takes place every 12 years. Over 80 million people visited in 2013. Unfortunately I was only able to visit one day, which was a quiet day and no bathing was scheduled but I am happy I've been there.